A highway bridge under construction collapsed Tuesday, trapping a delivery truck under the debris and injuring a construction worker. A Fed Ex truck could be seen partially crushed under a beam as rescuers worked for more than two hours to free its trapped driver. One large beam had crumpled the hood but missed the cab, and a second had landed on the back of the truck. The driver, finally removed on a stretcher, had major injuries, said Roger Craven, a California Highway Patrol dispatcher. A Fed Ex spokesman had no immediate comment. The construction worker was on top of the structure and fell about 35 feet when it collapsed at about 7:15 a.m. The worker was hospitalized with a fractured arm and hip injuries, said Kate McGuire, a spokeswoman with the Division of Occupational Safety and Health. The worker's condition was not immediately known. 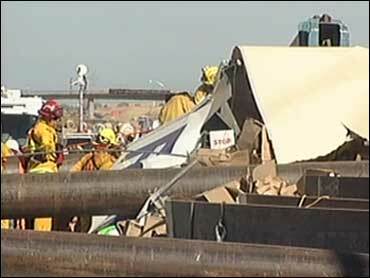 A California Department of Transportation vehicle also was damaged in the collapse. The overpass was being built at the intersection of highways 149 and 70 near Oroville, about 65 miles north of Sacramento, highway patrol spokesman Karen Ogle said. The collapsed material consisted of wood and steel beams that were being used as the forms to create one of the overpasses, said Shelly Chernicki, a spokeswoman for the California Department of Transportation. She said officials had not identified a cause for the collapse. "There's going to be a thorough investigation to why this happened," Chernicki said. The overpass is being built by FCI Constructors, Inc. and Granite Construction Co. A woman who answered the phone at FCI said the company had no immediate comment, and a message left at Granite Construction was not immediately returned. Construction was halted and will be shut down until further notice, McGuire said. Construction crews were trying to remove and stabilize the collapsed beams and other steelwork that collapsed, and motorists were being told to use detours using State Route 162. Near the overpass, another person was injured when a car a California Department of Transportation pickup truck collided, though it wasn't immediately clear if that crash was directly related to the bridge collapse.